Pokémon Let’s Go! Pikachu and Eevee are going to be divisive. The games seem meant to introduce a new generation of players to Pokémon, especially players who started with Pokémon Go. The changes made to gameplay may frustrate longtime fans, including me; I started playing in the late ‘90s and kept up with the franchise since. But I can’t bring myself to dislike Let’s Go! Eevee. 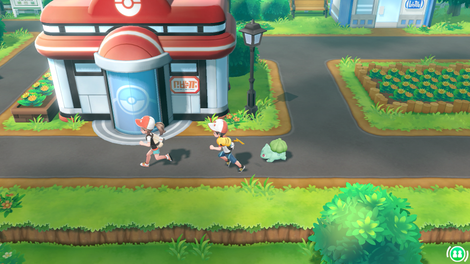 Despite the changes and the modern Pokémon Go-influenced touches, the magic of Pokémon persists in Let’s Go, just by virtue of it being Pokémon. This piece originally appeared 11/13/18. We’ve bumped it today for the game’s release. Let’s Go! Eevee and Pikachu are a rehash of Pokémon Red and Blue. This week, while reviewing the game, I happened to be visiting home; playing this game in my childhood bedroom, where I played my first Pokémon game, felt eerie. I sat with my Switch on my old bed, in a room that my mother hasn’t changed one bit since I moved out, surrounded by pale blue walls bedecked with magazine cutouts of musicians I discovered alongside my passion for games through Pokémon. As I play, the Strokes gaze down on me from an old Spin magazine cover from the early 2000s, alongside pictures of Conor Oberst from Bright Eyes. I had the perfect 2000s-era song lyrics for my Let’s Go experience: “Losing My Edge” by LCD Soundsystem, whose lyrics illustrate how far away childhood feels. In the song, the band’s frontman James Murphy recounts all the ways he feels like young hipsters are slowly pushing him into irrelevance. “I’m losing my edge to better looking people, with better ideas and more talent,” he talk-sings, “who are actually really, really nice.” In the 2000s, I didn’t really get this song. As an adult, playing Pokémon, I finally do. 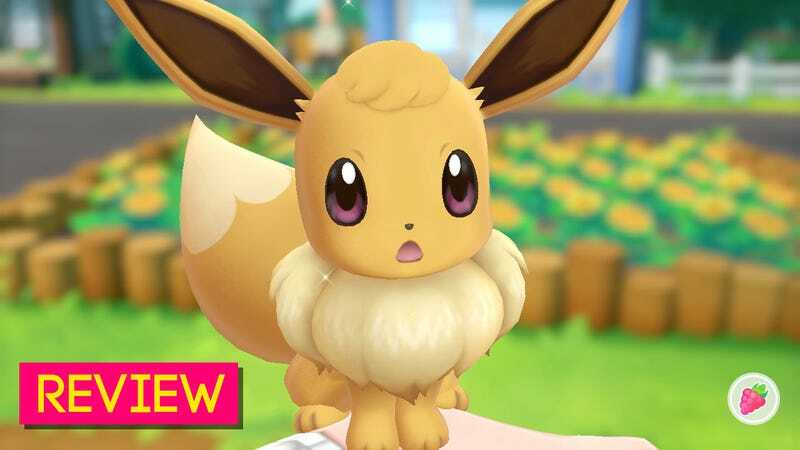 If you’re looking for a Pokémon game designed for the seasoned player, this ain’t it, chief. This is a game designed specifically for the kids I’m losing my edge to. This is a game for Pokémon Go players, for people who care more about catching Pokémon than battling them, and the mechanics have changed to suit them. You don’t have to battle Pokémon to catch them. You just have to be good at throwing a PokéBall, and you earn experience through catching alone. Most of the grinding you do—and you probably won’t do very much of it—is through catching Pokémon, especially catching multiples of the same kind of creature. You get an experience bonus if you’re on a streak of catching the same Pokémon over and over. Like in Pokémon Go, you earn candies by sending these excess Pokémon to Professor Oak, and these candies make your Pokémon stronger. You can also use these candies to outright change their stats. Those candies are probably going to be the most divisive part of the game. In previous entries in the franchise, you could change a few stats here and there, but it was a more arduous process than it is in Let’s Go! Eevee and Pikachu. In this game, if you want a traditionally slow Pokémon like Slowpoke to have a higher speed, you just feed it Quick Candies. My Pikachu, who had perpetually low health, managed to gain a respectable amount of HP when I fed it Healthy Candies. Competitive players who really care about stat matchups between different Pokémon are going to hate this change. I doubt newer players, who this game caters to, will notice or care. Experienced Pokémon players might also find the game too easy. My Pokémon only fainted five times, and the last two were in the marginally more difficult battles with the Elite Four. If you have any knowledge of how Pokémon types work, and what types of Pokémon are strong or weak against other types, you’ll be getting a lot of one-hit KOs. If you make your Pokémon eat enough Quick Candies, you probably won’t take any damage at all. There are “Coach Trainers” stationed around the map who promise tougher battles in exchange for rewards, but they didn’t stop me up much at all. Given those drawbacks, the game should have felt boring and unrewarding to beat. But it doesn’t. Unlike past Pokémon games, which felt rewarding due to the time and effort spent on grinding, this game gives the player an emotional payoff. "I've heard it, I've heard it, and it sounds like the nineties." The spirit of Pokémon as a series is the spirit of coming-of-age, and Let’s Go embodies that spirit. You get a Pokémon, in this case a Pikachu or Eevee, and embark on an adventure all alone. You defeat Team Rocket, take down gym leaders, and learn how powerful you can be. The morality of this story is simple: good guys are good, and bad guys are bad. It’s not about how complex the world can be, but about how you learn the skills you need to take it on, with the help of the pocket monsters you’re raising. Pokémon Let’s Go! Eevee and Pikachu doesn’t just test your mettle in the catching and battling of Pokémon. It gauges your ability to care for and nurture them. Taking care of your Pokémon, especially your initial Eevee or Pikachu, is a huge aspect of this game. When you let other Pokémon out of their PokéBalls to walk alongside you, they bond with you and like you more. In battle, they’ll sometimes dispel poison or other status effects because they don’t want to worry you, land critical hits more often because they want to be praised, or hang to consciousness at one HP so that they won’t let you down. Your Pikachu or Eevee will do this most often. They’re always out of their PokéBall, riding on your head or your shoulder. You can pet them using the Joy Con or just by touching the touchscreen, and they purr and trill. Sometimes they even bring you small gifts to show how much they care about you. Every time a Pokémon showed me how much they loved me in battle, I wanted to reach through the screen and hug them. It turned the tide more than once while I was fighting Gym Leaders. Loving your Pokémon not only feels good, it makes you better at the game—so lavish them. Retracing my steps, from Pallet Town to the Elite Four, had a profound emotional effect on me. When I first reached Celadon City, a bustling metropolis that is home to a huge department store, I remembered how teenage me had longed to move out of the suburbs to New York City, the city where I now live. Each Gym Leader was like meeting up with a old friend. It’s to the game’s benefit that these battles are exactly the same. I would remember where I tripped up in the past, and make sure I was ready this time. The battle with Lance, the leader of the Elite Four, frustrated me so much when I was younger, but being able to revisit it as an adult and best him on my first try felt like a real accomplishment. It’s not just that I got to right old Pokémon wrongs, though. It was that I could see myself and my journey to adulthood in new eyes. In Let’s Go, old characters from the first game show up; one of them becomes a sort of mentor to your player character and their rival. I could see myself taking that place, someday sharing Pokémon with my kids. There’s also Professor Oak, who serves here, as always, in an almost parental role to the player character. When I defeated the Elite Four and became Pokémon Champion, Professor Oak told me I had turned into a fine young woman. That’s when I started to cry. A character from my childhood, a sometimes lonely childhood where my relationship to Pokémon was what kept me going, had reached out from the past to tell me that I was doing okay. It was like the feeling I get when my parents say they’re proud of me. I had completed my childhood, and I had become a strong, self-sufficient person, ready now to take on the world on my own. In a way, playing this game, in my old bedroom, on my old bed, in my old house, provided me with a sense of closure that life does not often provide. I’ve played Pokémon since I was eight years old. Two decades later, I’m now twenty-nine now. This game taps into nostalgia, but also makes it clear that this is an experience you’re supposed to share with someone new to the franchise. By shaking a Joy Con, you can pop into someone else’s playthrough seamlessly, sharing their experience with them without taking away from their adventure. Nintendo also sent me a PokéBall Plus, and I was less enthused with that. It’s not responsive or comfortable as a controller, and playing in handheld mode felt most natural for catching Pokémon. I can see it being a fun toy for a kid who can’t play Pokémon at school, though. It’s a nice way to bring your Pokémon with you when you can’t play, as transferring them to the PokéBall Plus and walking around with them will net their experience. These are things I wished I’d had. Now that I’m older, I’m just happy I can share this experience with someone else, maybe even someone younger as they embark on their own journey to adulthood.